There is a lot to like about the Wren cafe. Firstly, there is the space that it occupies (inside St Nicholas Cole Abbey). I went at lunchtime when the way that the light came through the stained glass windows made the cafe a very relaxing and open space. The coffee is from Workshop, complementary water came in 3 flavours (mint, cucumber or lemon) while the food is cooked on site. This is important because it means that they have a great nut policy and could tell me which dishes were likely to contain nuts etc. A further nice feature of the lunch menu at the Wren was that you could select your portion size. Food waste is a major issue for our society and is not helped by the ‘one size’ portions served at many food outlets and cafes. Lunch was offered in two sizes (technically as a side or a main) but the ‘side’ was more than adequate for a mid-week lunch. Sofas in the corner of the room meant that you could relax and take in your surroundings in a comfy environment or, if you were just there for lunch, ordinary chairs and tables were dotted around the room. Of course, a place such as this will have plenty of things to notice about it. Whether your interest is in architecture or science, there is plenty to observe around you. What I would like to focus on though is a bit of science history that connects the name of this cafe with Isaac Newton, John Theophilus Desaguliers and the dome of St Paul’s Cathedral (which you can see from the front of St. Nicholas Cole Abbey). 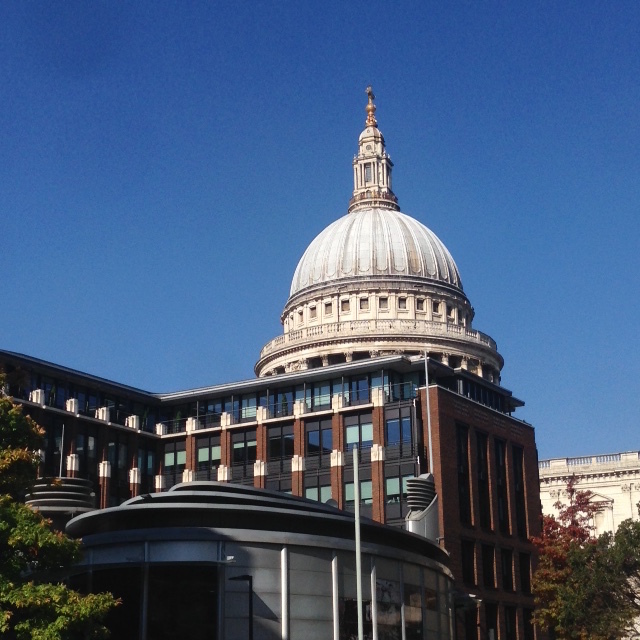 The Dome of St Paul’s, visible from the side of the Wren cafe. Perhaps we all remember the story told to us at school about how Galileo dropped two balls of different mass from the top of the leaning tower of Pisa. According to the story, the balls fell to the earth at the same time, thereby showing that the acceleration due to gravity was independent of the mass of the object and paving the way for Newton’s theory of gravity. Sadly, it seems that Galileo may never have actually performed the experiment (even if it was “re-created” in 2009). However there is evidence that Isaac Newton did perform exactly this experiment in 1710 from the dome of the soon-to-be-completed St Paul’s Cathedral. 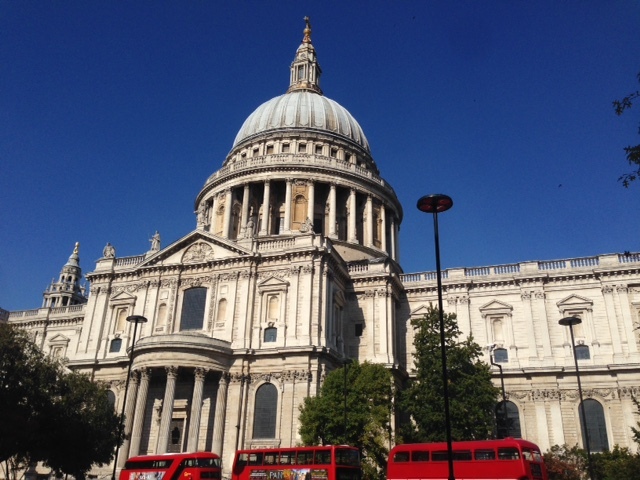 “From the top of St Paul’s church in London in June 1710 there were let fall together two glass globes, one full of quick silver [mercury], the other of air”¹. The globes fell 67m before shattering onto the cathedral floor (I’d hate to have written the risk assessment for that experiment). To avoid the possibility of human error, a trap-door mechanism had been designed to ensure that both globes dropped simultaneously. According to the story of Galileo told to us at school, we can calculate how long it would have taken those globes to drop to the floor: 3.7 seconds, independent of mass. So is this what Newton observed? No! The heavy glass globes took 4 seconds to fall, but lighter ones took 8-8.5 seconds! A few years later and Desaguliers repeated the experiment from slightly higher in the dome (but this time with hog’s bladders rather than glass) and obtained the same result. Another view of St Paul’s. Hard to believe that Newton actually dropped liquid mercury from the dome. This surprising result can be explained when we realise that Newton was investigating not gravity, but air resistance. While the gravitational acceleration is independent of mass, the upwards force due to the air resistance depends primarily on the object’s size (and velocity). This means that the deceleration caused by the air resistance will be different for two globes of the same size but different mass (Force = mass x acceleration). Heavy objects will fall faster in air (until the objects reach their terminal velocity). There is a certain irony in the fact that this result is opposite to what we feel should happen based on what we learned at school of Galileo’s experiments challenging the scientific orthodoxy of the time. However the result of Newton and Desaguliers’ experiments do not contradict the theory of Newton or Galileo, they just add an extra layer to the problem. We do not exist in a vacuum, we need to think about the air around us too. Both Newton and Desaguliers were regular coffee drinkers albeit at different coffee houses. Desaguliers frequented the Bedford Coffee House in the north east corner of Covent Garden while Newton regularly retired to the Grecian in Devereux Court (just off Fleet Street). Coffee houses were places that the latest science, politics or philosophy were discussed and debated. The Wren describes itself on its website as existing to “serve the ministry of St Nick’s talks“. 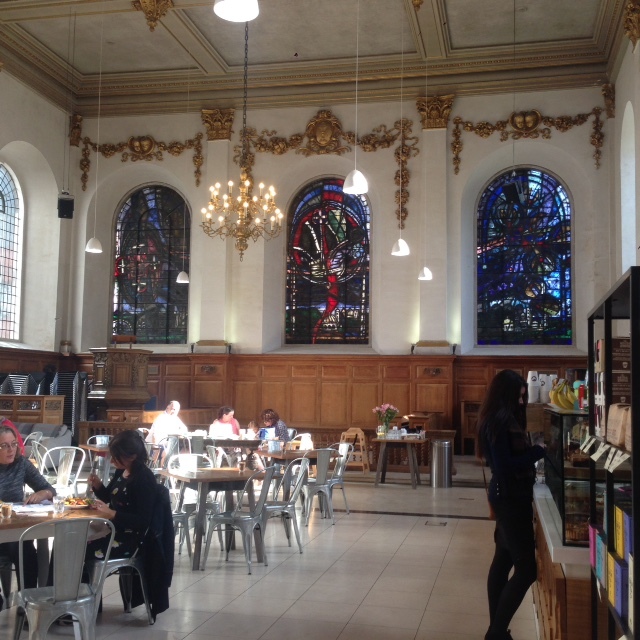 Sadly I experienced no discussion or debate on my visit (just a very nice, but solitary, lunch and good coffee) but it is interesting to see the tradition of the 17-18th century coffee houses continued in this Wren designed church and cafe.